Clean vinyl siding with a solution of 1 cup of bleach in 5 gallons of warm water, plus a squirt of liquid detergent. Use a window or deck brush with an extension handle, brushing lengthwise on the siding, let stand for 2 to 3 minutes, then gently rinse off with water from a garden hose with nozzle. Start from the top working down in about 4 foot wide sections. Wear eye protection and rubber gloves with protective clothing and boots. Protect plants with a covering of polyethylene. Ref: How to Build a House 5: How to Install Vinyl Siding. Use clear plastic peanut butter or mayonnaise jars for storage of screws. Mark the size on the lid with a felt pen. Ref: Jigs 2: Table Saw Push Stick. Below is the frame - 2x4s on the flat. Notice the brace with the bottom of the brace against the hinge side. 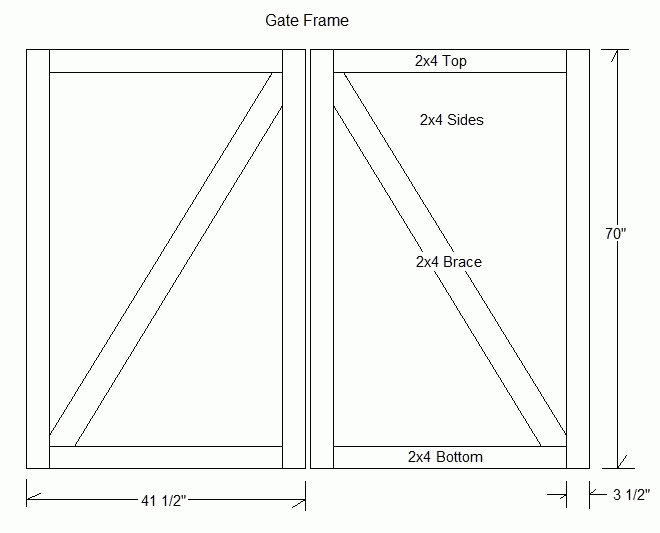 Hinges are 4" strap hinges in black or galvanized. 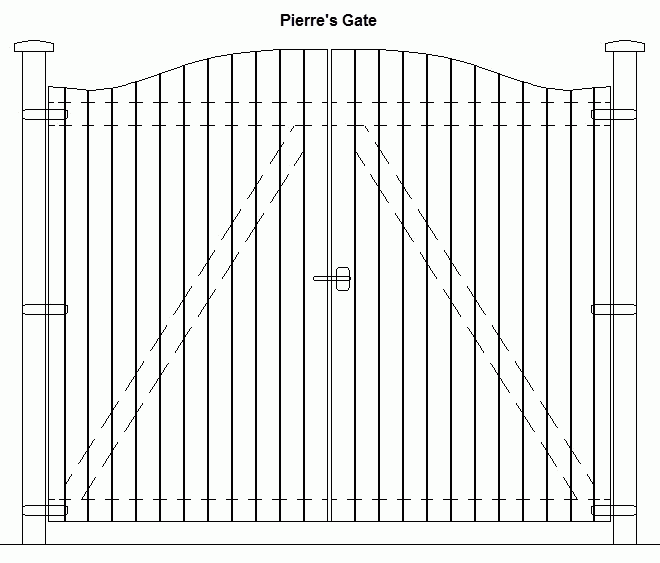 Make sure you have about 1/2 " clearance between the two gates and about 3 or 4 inches on the bottom. Fasten the boards on the frame first, then cut the tops off to suit. Thanks, glad you like it. No charge, Pierre, I notice you have been with us since 2008. I just would not feel good charging you for this. It is not really a plan, as such. Enjoy working with your boys. Thank you for the design, I really appreciate � do you know when my subscription is due? By the way� my teens are all girls lol. You should see them using framing guns and other cool tools! Ha! You got me there! I had 3 daughters myself, no boys. One was a book worm, and 2 were pretty handy around the house. Their husbands are jealous that they know more about do-it-yourself stuff than they do. Yes, you renew on Oct. 3rd. It should be automatic, unless you cancel. Dave, I was interested in the stair calculator and decided to check out what other information you provide on your site. I am a building code official and have found your site to be very friendly and informative. I will recommend your site to home owners wanting to do weekend projects. Thanks Again. Dave A. Thanks very much for you taking the time to send me this email. I appreciate it. Believe it or not this arrived on my birthday! Dave, I am installing a 7000 watt electric heater. It draws 31 amps. So I will install a 40 amps breaker. It needs to be "hard-wired". What size wire should I use? I am thinking either 8/2 or 8/3. The run will be about 15 feet from the "main". Yes, you need either 8/2 with ground or 8/3 with ground. Usually, if it is strictly 220V, you would use 8/2. If it has lights or anything that is run on 110V then you need the 8/3. It should have a terminal block with the color of wires marked clearly. Are you okay with the color code? Well, that does it for another month. I had some interesting emails last month, thank you for the support we get out there, it is appreciated. If you need advice on your projects at work or home, please become a member of our website, then send me an email.